A spacious, beautifully presented, executive style, first floor apartment situated in this exclusive development set in its own grounds in the sought-after suburb of Glenfield. The well planned accommodation briefly comprises entrance hall, kitchen/breakfast room, dining room, spacious lounge, master bedroom with en-suite, two further bedrooms and family bathroom. This individual home benefits from electric heating and double glazing and stands in beautiful grounds with secure gated access allocated parking. An internal inspection is essential to appreciate the size of accommodation provided by this luxury property as rarely do apartments of this standard and size become available. EPC C.
General Information: - The executive Gynsills Hall development is situated on the outskirts of the sought-after suburb of Glenfield which is located just outside the City of Leicester boundary, to the north-west, and is well known for its popularity in terms of convenience for ease of access to the afore-mentioned centre of employment and all the excellent amenities therein, as well as the adjoining Charnwood and New National Forests with their many scenic country walks and golf courses, the A46M1M69 major road network for travel north, south and west, the East Midlands International Airport at Castle Donington and the market towns of Hinckley, Market Bosworth, Ashby-de-la-Zouch, Coalville, Loughborough and Melton Mowbray. The combined villages of Glenfield and Groby offer a fine range of local amenities including shopping for day-to-day needs, schooling for all ages, a wide variety of recreational amenities and regular bus services to the Leicester City centre. General Description: - Constructed by well known, local and national builders, Messrs. David Wilson Homes, to an individual, executive design, Gynsills Hall provides an excellent opportunity to acquire a well presented and appointed, first floor apartment with unusually spacious, two reception roomed, three bedroomed accommodation and a secure designated parking space within a walled courtyard. Communal Hall - With secure access door to front elevation and staircase rising off to other floors. KitchenBreakfast Room - 11'10 x 11'3 (3.61m x 3.43m) - With one-and-a-half bowl stainless steel sink and drainer unit with hot and cold mixer tap inset to rolled edge work surfaces with plumbing for washing machine and cupboards under, matching range of base cupboard and drawer units with worktop over and complimentary range of wall-mounted eye level cupboard units with integrated wine racking. Integrated appliances including built-under double electric oven with four-piece ceramic hob, tiled splashback and stainless steel chimney style extractor canopy over, together with fridgefreezer and dishwasher. Also with laminate wood effect flooring, recessed ceiling spotlighting and Georgian style UPVC sealed unit double glazed window overlooking communal gardens. Lounge - 15'4 x 13'9 (4.67m x 4.19m) - With twin Georgian style UPVC sealed unit double glazed window overlooking communal gardens, TV point.. 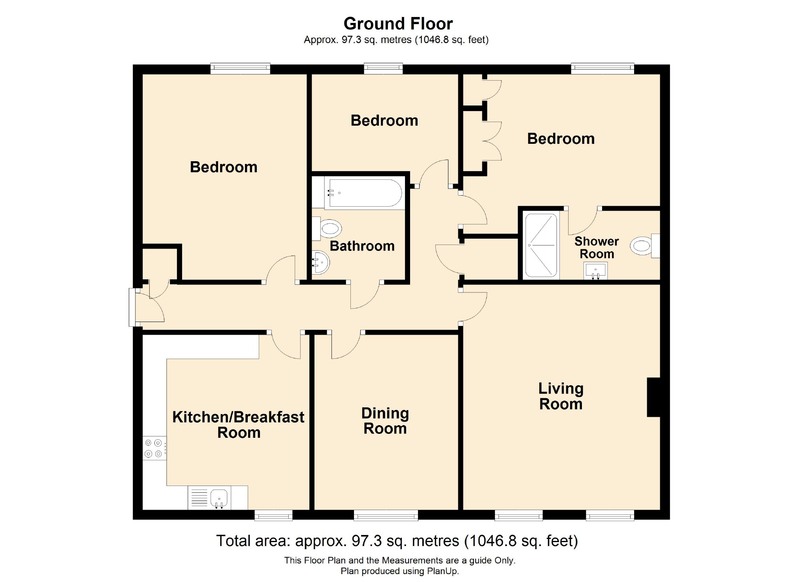 Bedroom 1 - 11'4 x 8'10 (3.45m x 2.69m) - (widening to 13'6), with UPVC sealed unit double glazed window, electric heater, TV point and built-in wardrobes. En-Suite Shower Room - 9'4 x 4'8 (2.84m x 1.42m) - With three-piece suite comprising wash hand basin inset into vanitory unit with hot and cold mixer tap and drawer storage below, together with close coupled low level w.c. and walk-in tiled shower cubicle. Also with tiled floor, part tiled walls and heated towel rail. Bedroom 2 - 13'4 x 11'3 (4.06m x 3.43m) - With electric heater and Georgian style UPVC sealed unit double glazed window. Bedroom 3 - 10'4 x 7'2 (3.15m x 2.18m) - With Georgian style UPVC sealed unit double glazed window and electric heater. Principal Bathroom - 6'10 x 6'4 (2.08m x 1.93m) - With three-piece suite comprising panelled bath with hot and cold mixer tap, pedestal wash hand basin with hot and cold mixer tap and low level w.c. Also with tiled floor, heated towel rail, part tiled surrounds and wall-mounted heater. Outside: - The property stands in communal lawned gardens with secure electrically operated gated access to allocated parking. Services: - All mains services, with the exception of gas, are understood to be connected to the property. Central heating is electric and electric power points are fitted throughout the property which is double glazed with sealed units and benefits from a security alarm system. Tenure: - We understand that the property is held Leasehold on a 999 year Lease as from 2001. The Ground Rent is approximately £100 per annum and the Service Charge is approximately £170 per month. There are also Maintenance Charges of approximately £1,000 per annum. Prospective purchasers should request their own Solicitor to check and confirm these details are correct. Directions - Proceed out of the Leicester City centre in a north-westerly direction along the old A50 Groby Road, continuing through Wood Gate and onto the dual carriageway. Proceed over the roundabout junction with New Parks Way, towards Groby, and having passed County Hall on the right hand side, turn right at the next roundabout into Gynsill Lane. Continue along Gynsill Lane and take the first turning right into Stelle Way, , as identified by the agents for sale' board. Proceed up Stelle Way and the apartment block can be seen directly ahead. Follow the road around to the rear of the building to a walled area of secure parking and the approach to Apartment 9 is on the right hand side via the electrically operated gates.